At Salzburg Airport more than 400 dispensers have been mounted. "The fragrance dispensers are a great thing to make sure our passengers are not bothered by unpleasant odors." Salzburg Airport has a passenger capacity of 1.600 passengers /hour (Terminal 1 + 2) and is Austria's second largest airport. In 2014, 1.8 million passengers have been accomodated here. The numbers make clear that the airport staff has a lot of work - especially on the busy winter Saturdays with up to 33.000 guests per day. 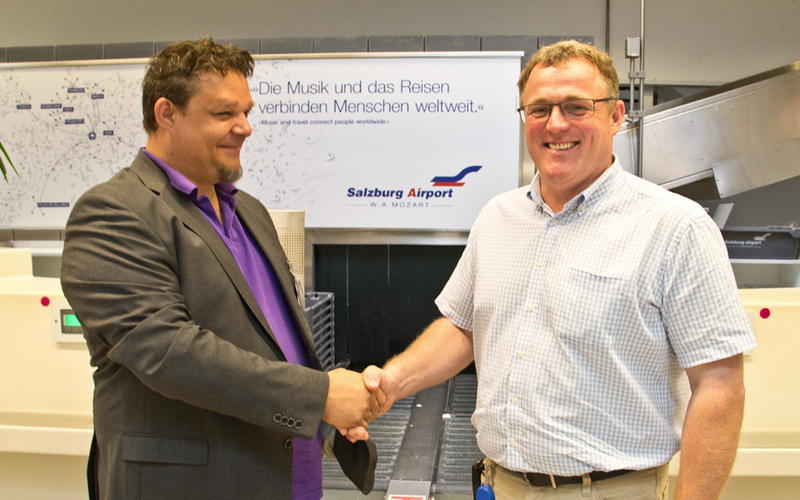 With 404 mounted HAGLEITNER dispensers and a total of 550 technical packages in-house, Salzburg Airport is one of our biggest partners, which we are very proud of. "We used to have products from different suppliers, that did not work well. Then we decided to standardize everything. HAGLEITNER is one of the experts in this field in terms of equipment and technology. " In case of intense traffic, when thousands of passengers use the airport, the most desirable item is toilet paper. With the toilet paper dispenser XIBU touchTISSUEPAPER and the multiROLL toilet paper, where one filling replaces up to 8 conventional rolls of toilet paper, one is now prepared for the simultaneous arrival of passengers. In addition the high-tech fragrance dispensers XIBU senseFRESHAIR create a pleasant atmosphere. Inconspicuous, but with great effect. The solution for small rooms for professional room scenting is called: XIBU senseFRESHAIR. This fragrance dispenser ensures freshness in the washroom. So the toilet visit for the passengers is a pleasant experience.